Microsoft’s news came early. Several hours ahead of schedule, pulling the band-aid off fast, the company announced second quarter revenue of $16.6b, a gain of just 2% year over year. In October, Microsoft had forecast earnings of 51 to 53 cents a share on revenue of $17.3 to 17.8b. Analysts, taking a more bearish tone, were expecting 49cents a share on revenue of $17.08b. The actual result of 47cents a share (revenue of $16.63b) fell short of both. Given the shortfall, and the breadth of the miss, some are questioning why Microsoft didn’t choose to reset expectations with a pre-announcement. The company didn’t address that kind of speculation. In a memo to staff (available here), Steve Ballmer did speak on the broader state of the company now and looking ahead. While long term prospects are good, he said, the pressures of the “worst recession in two generations” requires greater efficiency in operations. The $600m in operating expenses trimmed this last quarter wasn’t enough. “We need to do more,” he said. “More” will include cutting travel expenses by 20% and laying off as many as 5,000 people over the next 18 months. 1,400 of those job cuts will be immediate. During the analysts’ conference call to discuss the results, the question was raised as to whether these job cuts will include outside contractors. Microsoft said no. Outside providers are being evaluated separately and are not part of the 5,000 jobs counted. As many, or more, outside service providers could find their services no longer needed. Early speculation suggests the Windows Client Division, which was among the quarters weaker performers (revenues down 8% Y/Y and earnings off 13%), will largely be spared. Entertainment and Devices and Online Services are expected to be hit harder. As bad as workforce reduction of nearly 5.5%, or the missed expectations, is, not all of Microsoft’s news was bad. There were some positive bits among the different operating groups. 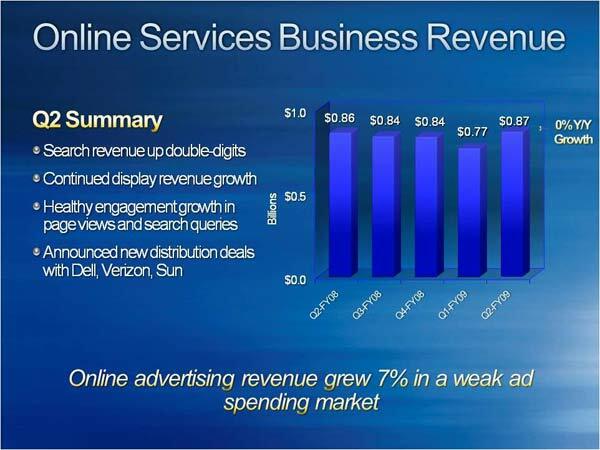 Online ad revenue was something of a bright spot in the otherwise dark disclosure. Total ad revenue was up 7% and search revenue was up “double digits.” Even as costs are cut, search will remain a priority. “While we take away 5,000 jobs we will add back a few thousand jobs in areas like search,” Steve Ballmer said during the conference call. The Entertainment and Devices division also showed a few glimmers of positive news. 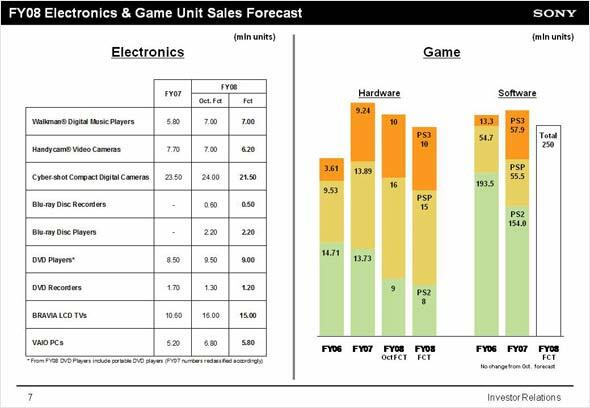 Sales for the division were up 3.5% to $3.18b. 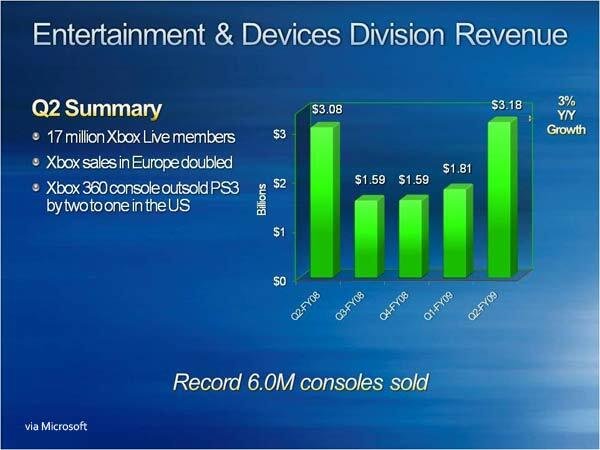 That owes partly to solid holiday sales results for the Xbox 360 platform. Unfortunately, price cuts helped drive some of that growth and caused the group’s operating income to fall backwards to $151m as compared to $375m for the same period a year ago. Looking ahead, Microsoft said the volatility of the market conditions are making it impossible for them to offer quantitative revenue and EPS guidance for the rest of the fiscal year. Microsoft is instead setting operating expense guidance at $27.4b for the year ending June 30th. Analysts’ projections for full year net income and revenue will likely drop off as the new information is processed and integrated into their models. Sony’s full earnings announcement isn’t scheduled for about another week but today, the company did what Microsoft didn’t: it gave markets a warning shot across the bow. Currency issues and weaker than expected consumer spending have been squeezing the company for months. 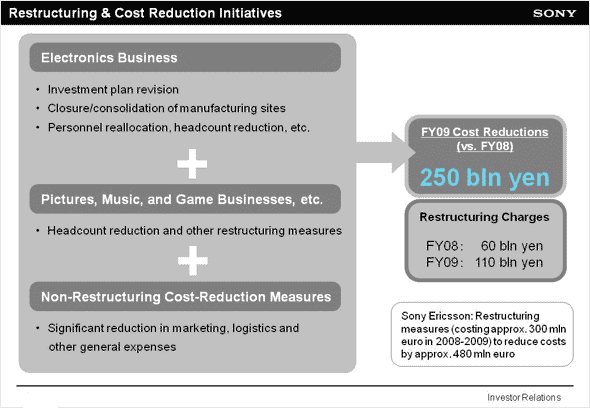 In October, Sony attempted to set expectations with a revised annual forecast for the fiscal year ending March 31st. Turns out, like Microsoft missing its own guidance for this prior quarter, Sony too has to redo its math. Pre-announcing (press release), Sony said they will absorb a net loss of 150b Yen for the fiscal year. That compares to prior guidance that had forecast profits of 150b Yen just three months ago. The loss will be Sony’s first annual loss in fourteen years. Sony’s sales forecast has dropped 14% since October to reach a new low of 7,700B Yen. For comparative purposes that sits grimly next to last year’s result of 8,871B Yen for the same period. 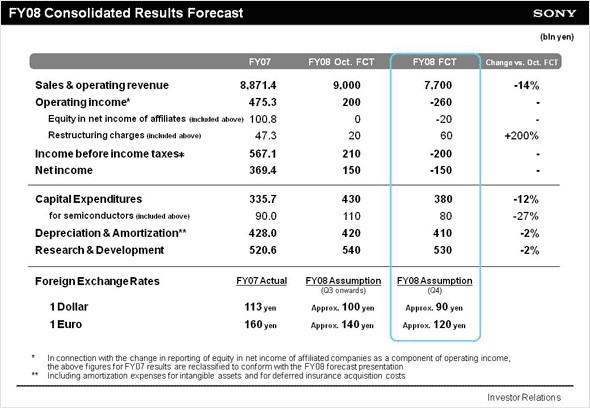 Based on the new forecasts, in the electronics segment Sony now expects operating income ot fall 340B Yen lower than forecast. 250B Yen of that is attributed to the economy. In the game segment, the new expectations are for operating income 30B Yen below expectations. Half of this is chalked up to currency issues and the other half to weaker sales. To put a tourniquet on the bleeding business lines, Sony says they are planning to “accelerate” the consolidation and restricting plans announced in early December. Sony will announce its full consolidated results for the quarter ended December 31st on January 29th. In preliminary numbers shown today, sales were off 25% year over year and net income was off 95% to just 10b Yen.